So, your hard drive’s given up the ghost and you can’t read your data. Read on to find out how you can get your documents back! If you’ve been searching the internet frantically and have found yourself on this page, you’re probably facing the potential of losing your data from your hard drive. All hard drives fail eventually (one of the fundamental rules of computing which most people, including myself, forget) and you spaced that one weekend and forgot to backup your data. Okay, lesson learnt. But how are you going to get your documents back? First reaction is to panic. You have important documents on there that you need for personal use or even worse, work. Once the moment of panic finishes, you Google it and see if what you are facing is hard drive failure. It could just be a system corruption that could cause a boot failure, which, fingers crossed, it is as attempts to salvage data can cost anywhere from hundreds to several thousands of dollars. So, onto the two ways that hard drives can fail: logical and mechanical. A logical failure generally means the components themselves are physically undamaged, but the file system has accidentally been changed or there is a corrupt file which the hard drive can not access (such as the Master Boot Record, akin to the index or table of contents of a book). The fact remains that, much like a book that’s missing a table of contents, the data is still there on the hard drive (unless it has been overwritten) which means you can potentially get most, if not all your data back! If it’s a mechanical failure, you’ll hear odd sounds coming from it, such as clicking, buzzing, whirring or all of the above. For example, if a hard drive’s read/write heads are slightly off track, the drive may not be able to read certain files. A complete read/write head crash will prevent computer users from accessing any data on the disk and may cause permanent data loss if the heads come into contact with the magnetic platters that store data. 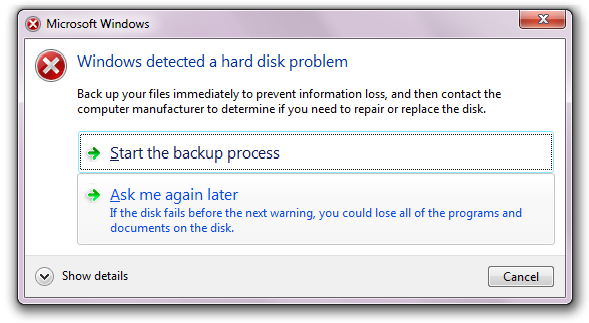 If this is the case, turn the computer off immediately, as keeping the disk powered up could damage the disk (and your data) even further. It is better to bring it to ITShop to have our experts attempt to recover the data as the process can be quite risky and tedious. 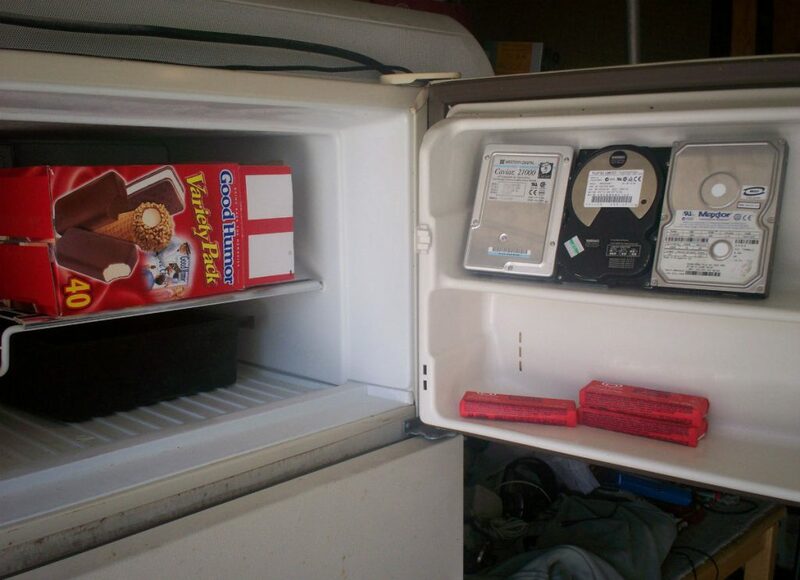 Those on the internet have found that placing a drive in the freezer in two airtight, vacuum-packed Ziploc bags to prevent moisture build-up does in fact work, but the odds are that if your drive is making the above sounds, it’s probably beyond this. I personally have had this issue, and the “freezer trick” saved SOME of my important data, but I DO NOT RECOMMEND this course of action, as it can lead to the potential of shorting out your drive as the hardware thaws out (which is what happened to me, so take that as you will) and damaging the drive even further. What works for some may not work for all, as every case is different. The absolute first thing you should check is the sound the hard drive is making. If the drive isn’t making sounds like a jet turbine trying to take off or someone tapping a pen on your desk, you’re in luck. You’ll also need access to another computer. Remove the hard drive from the PC and hook it up to the other computer as a secondary drive. To do this you will need a USB to SATA drive adapter or a hard drive caddy, which are good devices to have around for all types of hard drive diagnostics. You can buy these from us at ITShop. Best case scenario – your hard drive will show up on the healthy computer and will have all your files (yay!). If this is the case, your hard drive is probably fine, but you will still need to fix what caused it to fail in the first place, whether that’s a problem with the file system or the partition your files are on (side note – a partition is exactly that; a section of your hard drive is sectioned-off and the operating system reads it as a separate hard drive). Worst case scenario – your files don’t show up. This is when you once again panic, and realise how much impact those documents you created last year have on your life and how you will never have it again. But there are ways around this. If you have access to a Mac or a computer with a Linux-based OS (Linux Mint, Ubuntu, Fedora, Arch Linux etc) then you can try to mount the drive in that environment. Linux and Macs, which are based around the Unix kernel, have the magical ability to not care what file system a particular hard drive is running, and this is handy for data recovery when the MBR has decided to corrupt itself or even getting around the protections on certain Windows system files. However, this isn’t always a fix and, as I said previously, what works for some may not work for all. The process to try salvage data can be both a costly and lengthy process with no guarantee that your hard drive can be recovered. We have some good news though – information and/or documents can be extremely resilient as long as the drive is mechanically sound and hasn’t suffered major physical damage. So, cheer up buddy, not all hope is lost yet. If you have a broken hard drive, or have lost the data from yours and you don’t know how to get it back (or if you need advice on how to prevent this happening again) – come visit us at ITShop and have our experts give it the once over!